Oh you nummy food of anime fandom. I guess the best description for it is a japanese omelet and pizza combined. Now, who wouldn’t want some of that? I was lucky enough to have access to a restaurant that made these when I lived in Toronto. It was definitely a favourite. Sure, I’m not as avid (or rabid? I guess?) an anime fan as I once was but the love of okonomiyaki definitely remains. Sadly, I no longer live in Toronto and my okonomiyaki source is oh so far away. When my husband was on deployment a couple of years ago, I decided I needed some cheering up, he was in Okinawa (grawr!!) so okonomiyaki was the only possible cure. After some effort I had success! Omnomnom occurred. My husband came home and the okonomiyaki was put aside, he is not a cabbage fan so I figured it wouldn’t fly. Well, with my neck having kept me from doing a bunch of fun stuff (larp in particular), comfort once again is needed. This time made healthier. I was successful in getting a tasty, healthy recipe together but my leet flipping skills have failed. So no picture sadly. I suggest you search on google, there are some awesome okonomiyakis waiting for you to ogle them should you need a picture reference. Edit: I have since made okonomiyaki again and my flipping skills have returned! 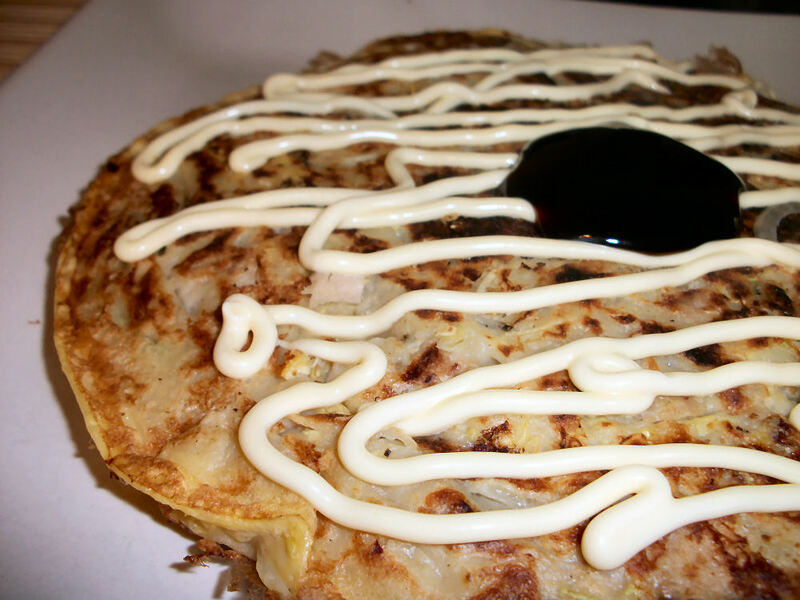 I have a picture of how I like to have my okonomiyaki. Num! Combine flour, salt, and pepper in a bowl. Add cold water slowly and whisk smooth. Add 1/4 cup egg substitute. Stir in onion, cabbage, and meat choice (if any). Allow to sit 10 minutes. Spray a pan or wok and heat medium high. Ladle half of the mixture into the hot pan and spread to form a pancake. Allow to brown on the bottom (approximately 5 minutes). Pour 1/4 cup egg beater on top center of the pancake. Flip quickly and carefully (those are those leet flipping skills I was talking about). Allow to brown and cook through, another 5 minutes approximately. Slide onto a plate. Repeat with remaining half of the mix. Makes 2 huge okonomiyaki servings. Nutritional info does not include the mayo, sauce, bonito flakes, or meat choice since those are your own variations. Each serving contains 223 calories, .5 grams of fat and 3.4 grams of fibre. With the right toppings this is not the naughty dinner option it tastes like. Sugoi! This entry was posted in Comfort Foods, Craving Buster, Dinner and tagged Cabbage, Egg, Onion, vegetarian. Bookmark the permalink.